Every morning I wake up, get the kids off to school and hit the treadmill. Then I sit down at the computer, eat breakfast and check my email. Lately, my most-anticipated email is the "AutoHotSheet" from my realtor, which lists the houses that have gone on the market (or adjusted their prices) in the last 24 hours. I eagerly open the files, tour the homes from the comfort of my own desk chair, and either mentally reject them or add them to my ever-growing spreadsheet of homes. That part isn't so pathological. I mean, I'm excited. We're moving to a new part of the country, buying a new house, starting a new job, and finally finishing the schooling phase of our lives that began when we were five years old. In 23 days we'll be out there, shopping for a new house. I should be excited about that, shouldn't I? The unhealthy part is that I have a list. Right now it has 22 houses on it. It's ranked in order of how much I love the houses, based both on the pictures I've seen and the extensive scouting and research time my realtor has already invested in us. Every day, as soon as I get the AutoHotSheet email, I check my favorite MLS numbers like they're winning lotto tickets or part of some elaborate religious ritual. When I enter the number and the corresponding house appears, I cheer, but when I enter the number and get nothing, I mourn. I even mourn the houses I only kinda like, because I'm hoarding my options right now. This week has been a mourning kind of week. There's one house I've been watching ever since the "AutoHotSheet" emails started pouring into my inbox last fall. It was new (but not plagued with the horrible two-story rooms I hate), the right size, the right location, and it had (and still has, I suppose) a totally killer kitchen. I've held it at arm's length for most of the winter, afraid to let myself like it too much, but last week I allowed myself to fall head over heels in love with it. I'd been looking at it for five months, I figured that it would last for four more weeks. On Monday morning, I entered the number for the little green house and nada, it's gone. This week I had a short but intense fling with another hot little house. It was fun while it lasted, but I have a feeling that it won't be returning my phone calls. The planner in me, the one who runs the numbers obsessively, needed to start looking back in October, needed to get a mental picture of the neighborhoods in her mind, needed to have something to fill this endless last year of fellowship. But the romantic inside me who falls hard should have waited until March to start looking. In a word, yum. When we went to the Hill Country a couple of weeks ago, we drove more than 100 miles out of our way to eat at Rebecca Rather's bakery, Rather Sweet in Fredericksburg. It was well worth the trip, and the calories, and I've spent the last few days devouring her book, making lists of recipes I need to try. Next week I'm ditching cub scouts to go to a dessert class she's teaching at Central Market, and we're actually making those luscious lemon beauties on the cover of the cookbook. I can't wait. I think I may officially be a groupie. 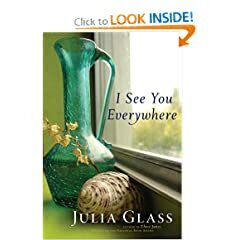 I loved Julia Glass's The Three Junes, and liked The Whole World Over enough to pick up I See You Everywhere because of Glass's name on the cover. I'm not sure that I'll read another of her books just on the basis of her name any more. The Three Junes was so good. I See You Everywhere didn't capture my attention the same way. It's the story of Louisa and Clem, two sisters separated by four years of age and personalities on opposite ends of the spectrum. Louisa wants domesticity and stability and love, while Clem needs adventure to feel fulfilled. They fight and love and lose each other over the course of the book. The characters (especially Louisa) are well-developed, but not much happens in the novel other than self-reflection. Louis reminds me of people in my own life to such a degree that reading her thoughts felt voyeuristic and made me vaguely uncomfortable. It was still worth reading, but didn't meet my expectations based on Glass's previous excellent novels. Sometimes I feel like I learn a lot more about the author's proclivities from reading a book than about his characters. Bohjalian seems kind of obsessed with hot chocolate and coffee drinks, describing in detail the way they're smothered in whipped cream. I don't feel like that tidbit is coming from his characters, but rather from his own opinions about the drinks. And generally I don't think that's a sign of a good writer. 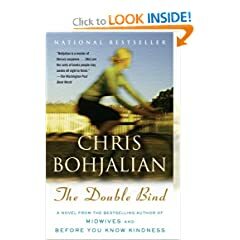 The Double Bind is an engaging story about Laurel, a twenty-something social worker who goes on a quest to trace a set of photos left by a recently-deceased client to their rightful provenance. If you're like me and jump ahead to the end when the book starts to get good, just for a sneak peek, you might be sort of let down when you get to the end. A lot of the bang of the book feels built on being surprised by the ending. Although the bang at the end was pretty good, I'd rather have a book stand on good character development than a sneaky plot twist. I loved Tana French's debut novel, In the Woods, so the bar was raised high for The Likeness. The premise is a bit improbable, Irish Detective Cassie Maddox goes undercover to try to solve a murder-- by posing as the deceased, to whom she bears a striking resemblance. She moves into her house, lives with her uncommonly close roommates, and tries to figure out who killed Lexi Madison (itself an assumed identity that Maddox created years earlier-- it's complicated), while trying not to fall too deeply into Madison's life. French gets it just right-- there's enough action to make the book a page turner, a thriller, a mystery, but it's more than that. I've always loved PD James because James has the ability to turn mystery stories into art by developing great characters. I feel like Cassie Maddox may be the heir apparent to Cordelia Gray and Adam Dalgliesh. Isaac loves preschool. Every Tuesday, Wednesday and Thursday morning, he's eager to get to school and show off his favorite stuffed animals to his friends (they always end up in his school bag). Each day when I pick him up he wants to give me a play-by-play of what the class did that day, what "word wall" word they learned, and what they ate for snack. He's a little bit obsessed with snack time. We get to bring the class snack every few weeks, and Isaac desperately wants everyone in the class to like his snack. He's brought blueberries and blueberry muffins, raspberries, cookies, crackers and pudding. Every time we get the bag he deliberates over what he's going to bring, and worries about whether or not the other kids are going to like it. There's one little boy in the class who isn't a huge fan of snack time. I need to say (just in case his mom is reading) that I totally relate and sympathize and understand what it's like to be the parent of a picky eater. I have a child who has subsisted for the last eight-and-a-half years on peanut butter, chocolate milk and goldfish crackers. But Isaac is the most adventurous eater of my kids, and he's only four, so he doesn't understand why his friend won't eat the snacks. This morning we had to bring the snack bag to class. Yesterday when it came home with us, Isaac decided that we had to make pizza, because pizza is his friend's favorite food, and he just knew that his friend would love pizza. I tried to explain that his friend might not like our pizza, or might not like eating pizza at 10:30 in the morning, but Isaac was undeterred. We had pizza for dinner, and made an extra pie to bring to class today. Isaac couldn't wait. "He's going to love my pizza!" he said when I dropped him off this morning. I wasn't so sure. After all, by today the pizza was a day old and cold. The friend didn't love the pizza. In fact, Isaac said, he wouldn't even try it. But you know what? I think Isaac is learning a good lesson from the experience-- one that will serve him well through years of his wife not liking the sweaters he picks out for her birthdays and his kids not appreciating the brownies with m&ms in the frosting-- you can't depend on the reaction of other people to make you happy. If day-old, stone-cold pizza makes you happy, then great, bring it for snack, but don't be sad if everyone doesn't love it. Eddie and I went away for a weekend in the Texas Hill Country. We slept here, ate here, and hiked here. I blogged about it here. Bliss. Speaking of Webkinz, our house grew by nine over the last two weeks. Bryce bought one for Annie, I got one for each of the kids for Valentine's Day, and Annie got four at her birthday party from various friends. If we cashed in on all of the Webkinz, I think we might have enough money for a down payment on our new house. Speaking of a new house, I think I've fallen in love with one house in Salt Lake. The good news is that it's been on the market for a while. The bad news is that a lot of the houses I've liked have sold recently and now I'm terrified that it will be gone by the time we get there. Annie had a birthday. She really, really wanted to get her ears pierced. When I was her age, I managed to convince my parents that I was the only kid in my class who didn't have her ears pierced (I totally wasn't) but I realized last time I was at her school that she really was practically the only kid in her class who didn't have her ears pierced. We tried to mentally prepare her ahead of time (this is the girl who throws total screaming fits when it's time to get a flu shot each fall) and the lady at Claire's was unfailingly patient with her. She said it hurt. But so far, so good. We had fourteen little girls at our house for Annie's party. Last year I thought three friends was too many. What was I thinking this year? I went to a Stake Women's Conference where I spent two hours biting my tongue so hard I thought I'd need surgery by the time I got home. We ate at The Chocolate Bar three times. Twice in one day. I love it when someone gets chocolate the way I get chocolate. I hurt my knee. I ran 18 miles the Saturday before my mom and Annie arrived and could hardly walk by the time I got home. So I took a week off, hoping it would be better. It wasn't. It felt great during our run last Saturday, but then hurt again on Sunday. Finally, I seem to be on the mend. I did four miles on the elliptical yesterday and it was fine after. Today I ran eight, and so far, so good.... I'm going to the doctor tomorrow just to make sure. If it continues to be bad, I might have to delay Boston for a year. Not fun. On the bright side, I've been spending a lot of time swimming. I even have a tan. Not bad for February, right? My mom and I ran a half marathon together last Saturday. With my knee in not the best shape, I decided not to push it too hard and just have fun with my mom. We finished in 2:23, which was a PR for her. She was also first in her age group. Go Mom!!! I had built-in babysitters, dishwasher emptiers and laundry folders for two whole weeks. I'll definitely miss that. But I'll miss the people more. Back to blogging, as usual. Which lately probably means infrequently. I just want credit for reading this again for book club. I read it in 2007 and reviewed it here. My friend Lyn owns this book, and I've spent some time perusing it at her house. When I found it on the half-off cookbook rack at Central Market, I had to take it home with me. For about five minutes, I considered giving it to my mom, and then I opened it and realized she'd have to buy her own copy if she wanted it. It's part scientific guide about the different types of chocolate, part memoir about Medrich's own awakening to her chocoholism, part experimental text (chocolate and greens, anyone? ), part well-tested baking book, and part love story. Love of chocolate that is. I've been reading the book for a few weeks, making a couple of things here and there, and last Saturday Annie and I had a brownie-baking taste test where we baked two of the brownie recipes from the book and tried them side-by-side. The kids prefer the cocoa brownies, which are impossibly smooth and fudgy, but I like the slight crunch of the brownies made with unsweetened chocolate. But no one turned down either variety. I think we'll try ice cream next. Yum. I didn't plan to read The Hunger Games. Science fiction and YA literature are two of my least favorite genres, and this book is classified as both. Besides, I wasn't sure that I wanted to get involved in another series, another sensation, so soon after finishing the Twilight mania. Then my friend Johnna gave the book five stars on Goodreads, and based on that recommendation, I reserved it from the library. I got it home and spent the next two days immersed in the society of Panem, rooting for Katniss and Peeta and their struggle against great odds to win The Hunger Games. I love strong female protagonists, unlikely heroes, complicated love stories and underdogs, and this book had all of them. Now I'm counting down the days until September when the second book is released. What can I say? I'm a follower-- and a sucker for a good story. 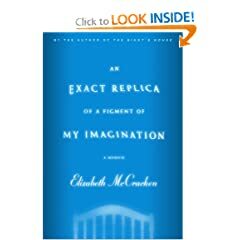 In An Exact Replica of a Figment of My Imagination, Elizabeth McCracken writes, sometimes in excruciating detail, about her experience giving birth to her first child, who was stillborn. It's both a hard book to read and a hard book to put down, and much more gripping than McCracken's fiction. It's not a book I'd give to a grieving mother who has just gone through the same experience, but maybe one I'd give to someone a few months later. She writes beautifully about the pregnancy, the birth, the aftermath, and ultimately, what it feels like to do it over again. I want to be able to write like this-- the pain, the beauty, all of it. But I don't think anyone wants to have this kind of experience in order to be able to have this kind of gift. As an aside, McCracken and Ann Patchett went to school together and she mentions her friend Ann multiple time throughout the book, and it's fun to see the real-life friendship of these two talented women. I've gotten out of chronological order already, since I actually read this book after reading McCracken's memoir. I was so excited I wanted to get my hands on another of her books. It was an interesting read about Mose Sharp, a Jewish boy from West Des Moines, Iowa (where my parents lived for several years, so it was fun reading about Valley Junction of a century ago) who runs away from taking on his father's shop and becomes a vaudeville star. He has a 40-year partnership with Rocky Carter, and they go on to star in countless movies together. It's the story of Mose's life, as it intersects with Rocky's. And looking back at it a month later, I like the book in retrospect. It took me several weeks to get through it, so the story didn't hold my attention the way some books do, but it was ultimately a worthwhile read, with well-developed characters and a nice combination of satisfaction and regret. 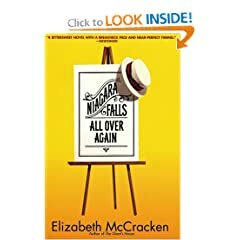 At first, this book felt like a series of loosely-connected short stories, either directly or indirectly related to Olive Kitteridge, a teacher living in a small town in coastal Maine. After four or five stories, which progress in roughly chronological fashion, the reader starts to get a picture of Olive, who is pretty darn unlikeable. She cuts a sleeve off her new daughter-in-law's sweater, just to mess with her mind. She doesn't cherish her husband like she should. She's prickly. Yet, over the fifteen or twenty stories, I grew to love Olive, even when I didn't like her. She felt more self-actualized at the end of the book too-- like she realized some of what she'd missed out on at other parts in her life and wanted to make things better. Weeks later, I'm still thinking about Olive and the other characters in the book, which I guess is a mark of a pretty darn good story.